Where do I use my DW Sports voucher code? Shop online at DW Sports and discover a huge selection of sports clothing for both men, women and kids including tops, tees, hoodies, sweatshirts, joggers, tights, shorts, tracksuits, jackets, coats, baselayers, swimwear, leggings, bottoms and sports bras. You can also find running, training, lifestyle and football shoes, plus shoe accessories, hats, caps, bags, backpacks, socks, underwear, gloves and headphones. All these products are available at great prices from huge names in the sports industry such as Nike, Under Armour, Adidas, Asics, Puma, New Balance, Brooks, Salomon and Speedo. 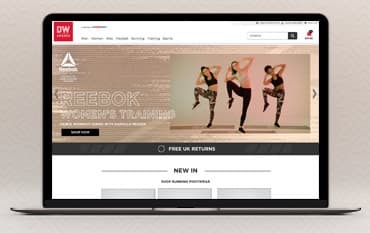 DW Sports also have dedicated sections for football, running and training where you can find sport-specific equipment and clothing as well as popular collections from names like British Rowing, Rebook Danielle Peazer, Puma Lewis Hamilton and Puma Adriana Lima. You can also find sportswear for sports like rugby and golf including rugby kits, rugby boots and equipment as well as golf clothing, accessories and balls. There’s also clothing available for sports like basketball, boxing, darts, snooker, rowing and yoga. DW Sports stock a huge selection of football boots for men, women and kids from collections like Adidas Predator, Adidas X, Adidas Nemeziz, Adidas Copa, Nike Phantom, Nike Mercurial, Nike Hypervenom, Nike Tiempo and Puma. If it’s football kits and memorabilia you’re looking for you can find premier league kits from teams like Arsenal, Chelsea, Everton, Liverpool, Manchester City, Manchester United, Newcastle, Southampton, Spurs and West Ham. There are also kits for European leagues too like Barcelona, Real Madrid, Paris Saint-Germain, Bayern Munich, Juventus and Borussia Dortmund, plus international kits for teams such as England, Brazil, Portugal, France, Argentina, Belgium, Germany and Spain. DW Sports also provide plenty of football equipment including bags, boot bags, boot accessories, footballs, football socks, goalkeeper gloves, kid’s base layers, shin guards, training equipment and even retro football kits. If you’re a keen runner or are looking to take up the sport then kit yourself out with all the required clothing and equipment from DW Sports. Discover men’s and women’s running clothing including tops, tees, shorts, tights, jackets, coats, accessories, leggings, bottoms and sports bras, plus running shoes, products for running beginners and accessories like water bottles, headphones, socks, shoe accessories and insoles. At DW Sports you can also find gait cushioning and supports plus collections from Winter Running, Nike React, Adidas Solar, Nike Pegasus, Brooks, Salomon and New Balance Hi-Viz. All these running products are available from huge names in the industry like Adidas, Asics, Brooks, New Balance, Nike and Salomon and are brought to you at an affordable price at DW Sports. What is DW Sports returns policy? If a customer returns goods because they decide that they no longer want them they must be returned within 28 days of receipt. How can I find your nearest store or gym? To find your nearest DW Sports store or gym please use the store finder here. DW Sports is a high-quality retailer of men’s, women’s and kids sports gear from huge brands in the industry. With a huge selection of clothing, accessories and shoes as well as running, training, rugby, golf and swimwear products, you can find all you need at DW Sports to feel and look your best while exercising. Shop for all these products from names like Nike, Adidas, Puma, New Balance, Speedo, Reebok and many more huge brands and make sure you use a DW Sports discount code from us to save money on your purchases.